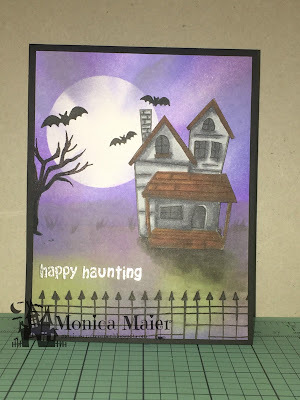 Monica's Craft Corner: Happy Haunting. 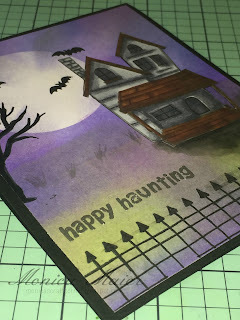 Today I'm sharing a card that I made will looking at the Simon Says Wednesday challenge blog. 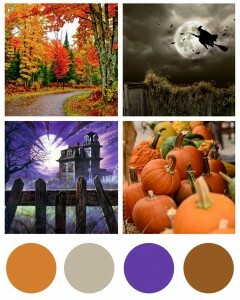 They have an awesome fall/ Halloween mood board and color combo for inspiration! I had a hard time choosing, but ended up using the bottom left image as the inspiration for my card. I masked off the moon area and distressed the background. Stamped the tree, fence and bats on the background. On a scrap piece of card stock I stamped and colored the haunted house, then fussy cut it before adding it to the background. I then heat embossed the sentiment in silver to finish the card. Thanks for stopping by and a spooktacular day!!! This is fabulous! I love that background that you created! Awesome scene! Thanks so much for playing along with us over at the Simon Says Stamp Wednesday Challenge!